It was great happiness for me to be a part of Chad and Alex’s wedding ceremony on May 29th at the lovely Woodmark Hotel. I could not have been happier when Alissa from Maris Events called me to set up a meeting. And when I sat down with Alissa, Chad and Alex, it was kind of like a fabulous first date – I just immediately liked these two wonderful men. 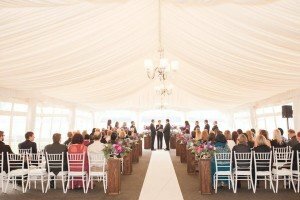 On Memorial Day weekend, we all gathered on Sunday evening under the ‘party tent’ at The Woodmark for their ceremony. Remarkably, the sun came thru for the hour before/during ceremony and it was one of those great gifts of a lifetime. 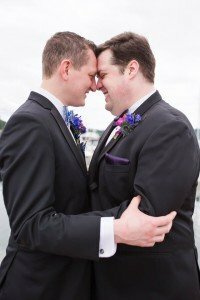 Perhaps the best thing for me was being up close to Chad and Alex and the smiles, touches and loving glances they exchanged during ceremony. I wanted to shout to their wonderful photographer, Miguel Cornelio, during ceremony, “you’ve got to get this!” And I knew that Miguel was on it. We had timeless moments, we had contemporary moments. We had love, kisses, joy, gratitude and an abundance of happiness. A wedding like this has many moving parts. Those parts, on this day, went without a hitch, thanks to a great team of talented people. My great gratitude to Planner Alissa Lawton from Maris Events – Alissa, you are simply lovely, so talented and one of the very, very best.